Our breath and our emotions are connected to such an extend that one becomes the condition for the other for example, we can only be angry or fearful if our breath is fast and shallow, and we must not be breathing consciously. With the breath and emotions joining forces, the mind has no choice but to comply. The mind will generate the thoughts that fuel the negative emotions and the body will tense itself to intensify the emotions. The thoughts will come so rapidly that it appears to be a separate entity. We then react based on the negative emotions and we allow the force of karma or our conditioning to come into motion. We become a slave to our mind, conditioning and karma. That is why some of us claim that we were not ourselves when we reacted to certain negative emotions especially anger. If we remove the conditions that fuel the negative emotion, we will become the master of our minds and will be in a better position to act with wisdom instead of reacting based on our past conditioning. Whenever a negative emotion arises we must recognise that the negative emotion will cause us to react in a way that we may later regret. 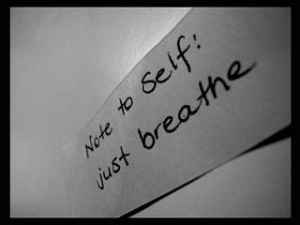 One way to prevent our minds from generating thoughts that will fuel the negative emotion is to focus on our breath. We follow our in-breath and out-breath in their entirety as if to see the movement of our breath within our body from the tip of our nostrils down to the bottom of our abdomen. As we focus on our breath, the negative thoughts will die down. It will try to come back again and we may lose focus on our breath but as soon as we become aware of this, we bring back our attention to our breath. After focusing on our breath for a few moments, we then bring our attention to the emotion while still maintaining awareness of our breath. We try to mentally point to the location of the emotion in our bodies. Take the opportunity to understand the negative emotion: Does it have a shape? Is it heavy? Our emotions are very shy. When we focus on them, they will try to hide but the moment we lose awareness, they will pop out again with a Bang! But that is fine, we just need to bring our attention back again to the emotion like a loving mother giving special attention to her new born baby. The emotion will then become friendly and less burdensome. It is beautiful. The beauty of breath, just imagine it; without it, the mind stops but will the heart stop? So that means you die or is it a stop over? It is automatic you dont have to do anything; its there. But if you are aware of the breath then life becomes more beautiful.Try it, is fun.